Carlos Barbosa Lima and Larry Del Casale present their new CD “Delicado” at the Jazz Forum! Acclaimed internationally as one of the world's leading guitar masters, ZOHO recording artist, Carlos Barbosa-Lima is recognized throughout the world for his extraordinary skills as a performer and arranger of a wide variety of music for the guitar. Although primarily known as a soloist and arranger, the virtuoso guitarist Del Casale completes Carlos Barbosa-Lima’s melodies with panache and verve. 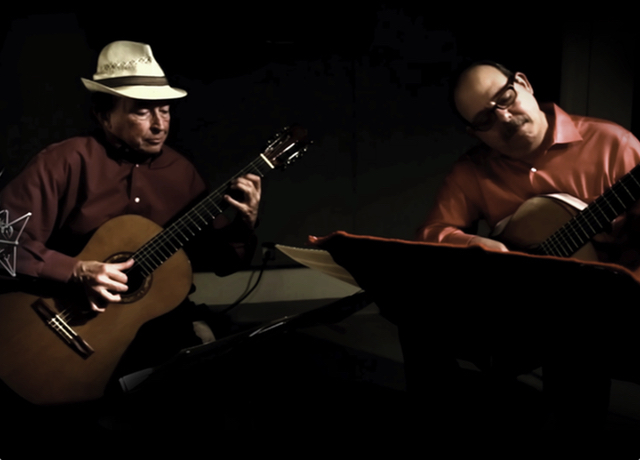 Carlos Barbosa-Lima and Larry Del Casale differ from other groups and the two-guitar format really lets them stretch out as top musicians. The duo has now been performing together for 15 years. Don’t miss Carlos Barbosa-Lima & Larry DelCasale at the Jazz Forum, April 28.